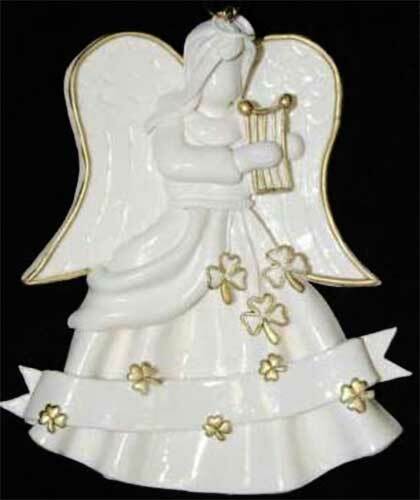 Irish Christmas ornament features an angel with a harp and shamrocks. This Irish angel ornament is ready to hang on your Christmas tree with the included gold cord. This Irish Christmas ornament features an angel that is enhanced with gold shamrocks along with a gold harp, the national symbol of Ireland. The Irish angel Christmas ornament is a dimensional design that measures 4 1/2" wide x 5" tall; she is made of polymer clay.